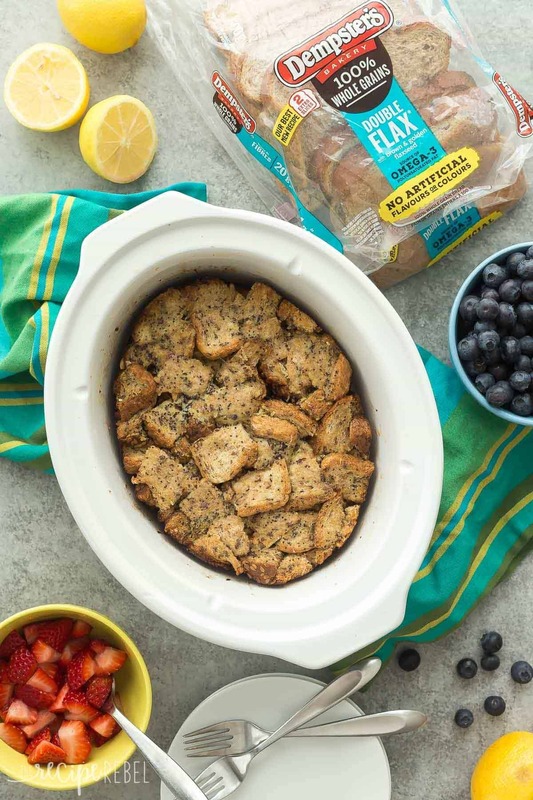 This Overnight Slow Cooker Lemon Poppy Seed French Toast is an easy, overnight breakfast or lunch! 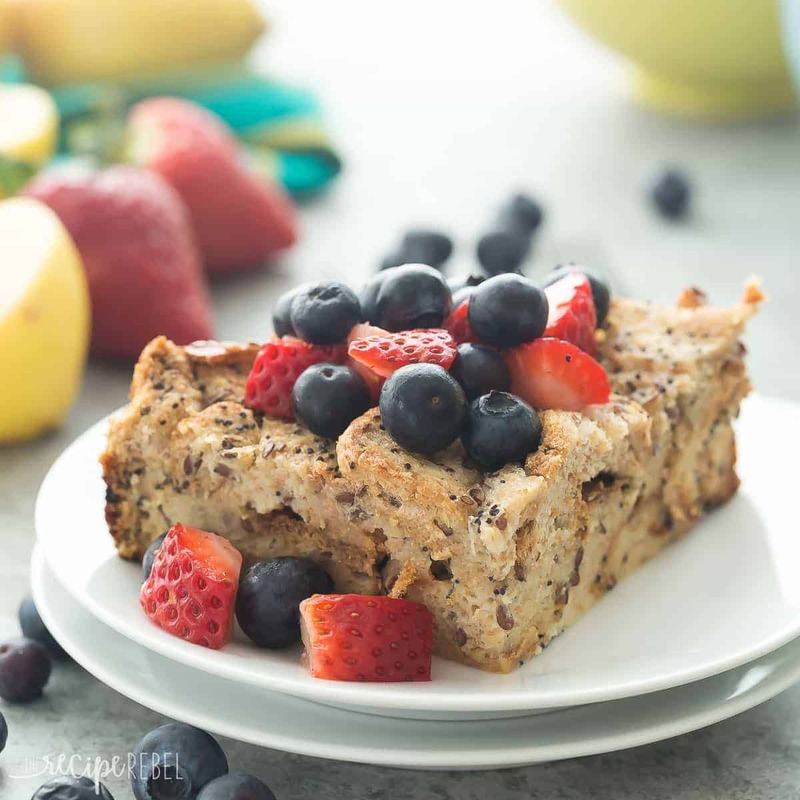 It’s packed with lemon flavor and topped with fresh berries, perfect for a relaxing weekend breakfast. Sometimes, I really feel like I’m getting old. As a kid, I remember scoffing at anything lemon and heading straight for the chocolate, or if not chocolate then surely caramel or something ridiculously over the top and sugar loaded. I find myself craving fresh foods and flavors, and would much rather have something light and citrusy, or loaded with fresh fruit, than something more indulgent. And if that light and citrusy thing, loaded with fresh fruit can be breakfast or lunch or brinner, and is packed with whole grains (Dempster’s 100% Whole Grains Bread — made with no artificial flavours or colours), protein (eggs and milk), and made without artificial ingredients, you can absolutely count me in. It certainly doesn’t hurt that it tastes amazing! I consider myself lucky that my kids love lemon as much as I do. It’s something we all love and there are no fights over breakfast, lunch or dinner when this is on the table. We can easily polish off most of the casserole dish on our own in one sitting! Because I know we don’t always have 2 to 4 hours to wait for breakfast, I wanted to include oven instructions as well. 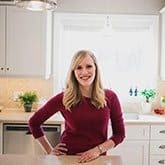 The same recipe is easily made either way, making it perfect for a late holiday brunch or a quick, no-effort hot breakfast on a weekday morning. If you don’t want to add the poppy seeds, feel free to leave them out — I think they look pretty and they are actually good for you, too! You can also add the berries right in the French toast before baking if that’s what you prefer. Feel free to mix and match to suit your tastes! 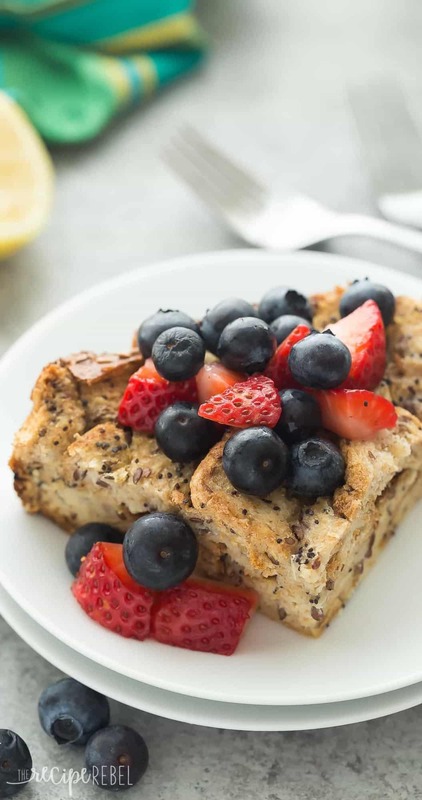 This Overnight Slow Cooker Lemon Poppy Seed French Toast is an easy, overnight breakfast or lunch! It's packed with lemon flavor and topped with fresh berries, perfect for a relaxing weekend breakfast. Lightly grease a 2-4 quart slow cooker and add bread cubes. In a medium bowl, whisk together eggs, milk, honey, lemon juice and zest, and poppy seeds. Pour over bread in slow cooker. Cover and refrigerate for 2 hours or up to 24 hours, or cook immediately if desired. Cook on low for 3-4 hours or high for 1.5-2 hours (OPTIONAL: bake in an 8x8" dish at 350 degrees F for 30-40 minutes). Serve warm with fresh berries and a drizzle of honey or maple syrup if desired. Cook on low for 3-4 hours or high for 1.5-2 hours (OPTIONAL: bake in an 8×8″ dish at 350 degrees F for 30-40 minutes). Serve warm with fresh berries and a drizzle of honey or maple syrup if desired. The heading says overnight and the instructions say 3-4 hours. So actually I guess this is not an overnight recipe. Otherwise it sounds pretty good. It is an overnight recipe because you make it the night before and it sits and soaks overnight. So, yes, it’s an overnight recipe. I use to hate lemon as a kid too! Now, when I do my Christmas baking lemon bars are the first ones on the list because I can’t get enough of them, lol! 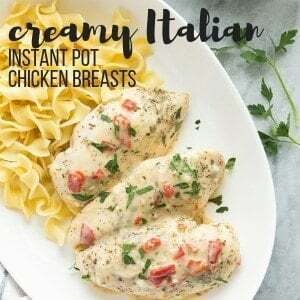 Love the idea of making this in the slow cooker and that it’s healthier! It’s funny how it’s the same for a lot of people! Thanks Malinda! What a great idea for french toast! 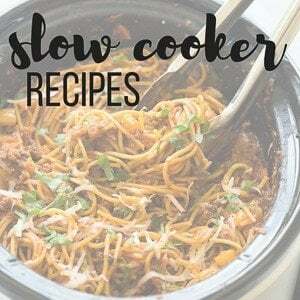 I’ve never thought to make it in a slow cooker! I used to hate anything lemon related when I was younger but now I can’t get enough of the bright zippy flavor, especially in the winter. 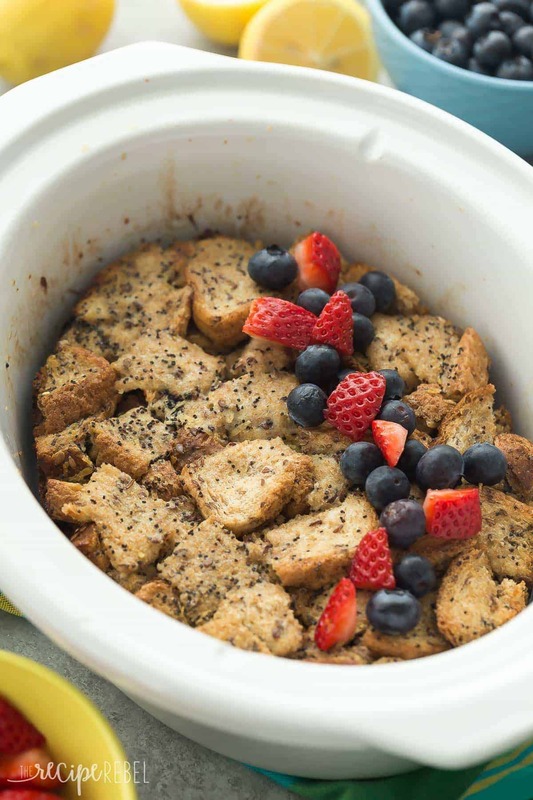 This overnight french toast casserole sounds like a dream. Thanks Nicole! I was the same! I was the same way when I was little, too! I really didn’t like anything with lemon. But, now that I’m older, I’m definitely coming around. This french toast looks incredible, Ashley! 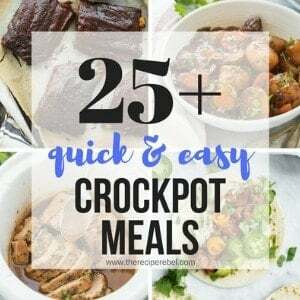 I’ve never made it in the slow cooker before, so I’m loving this fun twist! This was my first time and I couldn’t believe how well it turned out! I love it! 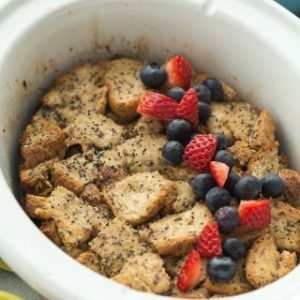 I’m a sucker for overnight french toast bakes, but in the crockpot too?? I’m sold. This looks SOOO good with the lemon poppyseed flavors! Such a nice lighter switch-up from the usual heavier french toast!